I am using xfce desktop in ubuntu 12.04 and added the shortcut keys in order to turn off my monitor. 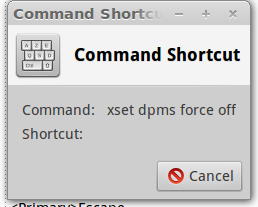 The command "xset dpms force off" works fine in terminal. But when it added in the keyboard shortcuts, the monitor turns off a second then turns on immediately. So how can I turn off the monitor using hotkeys? sh -c "sleep 1 && xset dpms force off"
Not the answer you're looking for? Browse other questions tagged command-line shortcut-keys xfce or ask your own question. Is there any way to make a hotkey turn the screen off? How can I make a keyboard shortcut to turn off and turn on the screen? How to turn off the display via the command line? How to search through all keyboard shortcuts that use a certain key? How to turn off the screen in Ubuntu 17.10?